Rubenerd: Is someone at Westpac reading my blog? Is someone at Westpac reading my blog? 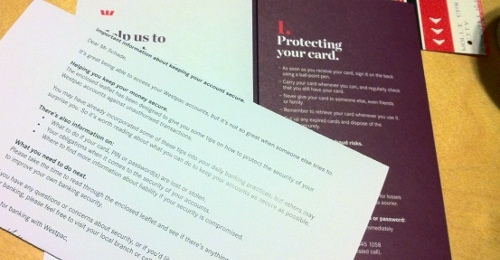 After recently voicing my concerns about their internet banking policy here, Westpac sent me a cover letter and pamphlet this morning that discuss card and internet banking security. My old man and sister are also Westpac account holders, but neither received a letter like this which leads me to two possible conclusions. Either I was statistically chosen at random based on the fact I use their internet banking services and debit cards, or someone at Westpac reads my blog and wanted to appease me. Because the latter is more fun, I'm going to assume it.